CONCORD, N.C. (Sept. 28, 2018) – Kurt Busch has quickly developed a good rapport with the Charlotte Motor Speedway ROVAL™. 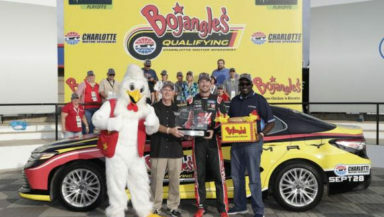 Busch dedicated the new ROVAL™ infield fan bridge on Wednesday and took Bojangles’ Qualifying by storm on Friday – earning the pole for Sunday’s inaugural running of the Bank of America ROVAL™ 400, the first playoff road-course race in Monster Energy NASCAR Cup Series history. Busch – one of 16 playoff drivers – roared around the 17-turn, 2.28-mile ROVAL™ in one minute, 16.805 seconds at an average speed of 106.868 miles per hour. A.J. Allmendinger will roll off second after the accomplished road racer missed the pole by just .041 seconds. Playoff drivers Alex Bowman, Chase Elliott and Kyle Larson completed the top five. Jimmie Johnson, Clint Bowyer, Jamie McMurray, Ryan Blaney and Chris Buescher rounded out the top 10. Defending series champion Martin Truex Jr. will start 13th. KURT BUSCH, No. 41 Haas Automation/Monster Energy Ford (Pole Winner): “This is really special to win any inaugural race or pole. And to have this little trophy next to me means a lot. When you go into a new event, you have to execute with fundamentals and an open mind. And the way our No. 41 team approached this weekend was to cover all of the fundamentals and have our bases covered. To purchase Bank of America ROVAL™ 400 tickets – which include access to Saturday night’s Sammy Hagar and The Circle concert – fans can call 1-800-455-FANS (3267) or shop online at www.charlottemotorspeedway.com. Kids’ tickets cost just $10.